Shakari's jacket comes from Rockers Closet, a "DIY Thrift" shop on 4th St in South Philly that takes donated old clothes and upcycles them into fashion. The scarf was brought back by a friend on a trip to Guatemala. The boots are a gift from her mom, and neither Shakari nor her mom have been able to figure out what brand is attached to them. The pants, like everyone else's these days, are Zara. I'm liking this whole asking people what they're wearing thing. People have all sorts of interesting tidbits to tell about the things they put on. We adorn our bodies in the stories of our lives. 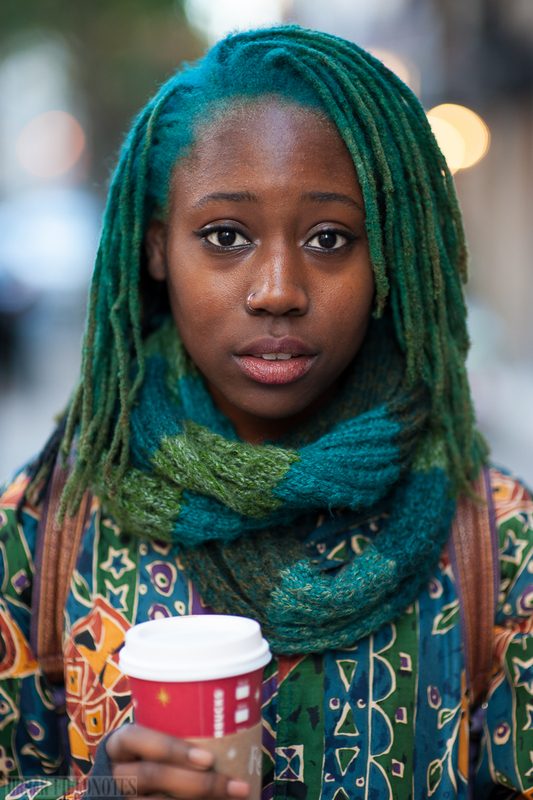 You wouldn't think that blue and green would be the most flattering hair colours, but the combination looks just gorgeous with her skin tone, and even cooler with the matching scarf! I was wondering if you had any recommendations on books or online essays about fashion theory (vague, I know). I've been hard pressed to find things or if I do, they tend to be quite dated, which I suppose comes with the territory. I really appreciate what you're doing! Thanks @lauren! For contemporary fashion theory probably the best journal is called, simply, Fashion Theory and is put out by Berg Publishers. 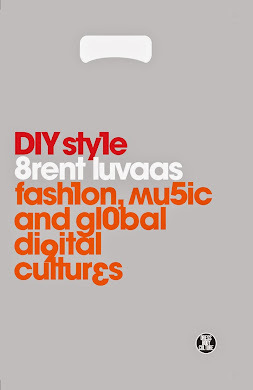 I have an article coming out in there in February on Indonesian personal style blogs. There are a number of books I'd recommend as well. The classics, of course, are probably Roland Barthes' The Fashion System (though that may be one you find a bit dated) as well as various essays by Walter Benjamin in The Arcades Project. Recent classics include Caroline Evans' Fashion at the Edge, Gilles Lipovetsky's Empire of Fashion (one of my favorites but more theory than fashion), Ted Polhemus' Fashion and Anti-Fashion, Streetstyle, and Style Surfing, and Elisabeth Wilson's Adorned in Dreams. As for newer stuff, check the publisher Berg's website. They're the best known publisher of fashion theory. Routledge also has a good selection, and Yale University Press has a few notable titles as well. 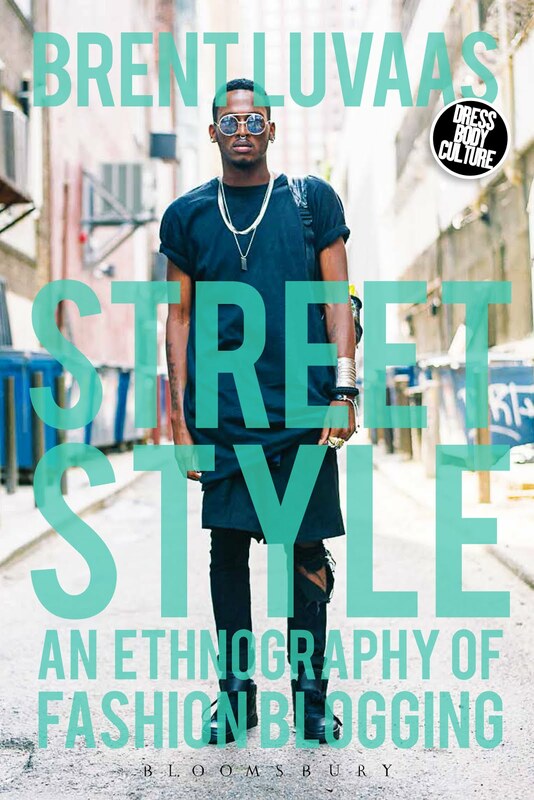 Christopher Breward has written a lot of interesting stuff about London style. David Gilbert has written some valuable stuff about the geography of fashion. Ann Marie Leshkowich, Carla Jones, and Karen Tranberg Hansen are all well-known for dealing with global fashion from an anthropological perspective. Daniel Miller and Sophie Woodward also just put out an interesting book called Global Denim. loooove the colours of jacket, scarf, and hair. way to brighten this grey week! Does this girl have a tumblr or a twitter or something like that? That's a nice jacket by Rockers closet. I just like it. Shakari is looking great wearing that ladies parka and I love her hair color pretty much.